This article was really eye-opening. We’ve had a problem with homelessness in Bloomington, Indiana, and Bloomington, like Seattle, is very liberal. I was just there last week. It’s bad. This was eye opening, thanks. But behind the beauty and the ideals, behind the bridges and the ballparks and the beautiful buildings, the dirty work is the fight. Great dreams and great cities don’t survive without a fight. Seattle is dying. Maybe with all the wealth and growth we became so pleased with ourselves or so busy that we forgot about the hard part. Maybe good people who go to work every day and raise families and pay taxes–the ones who built this city and dreamed the dream–forgot about the dirty work. Maybe we forgot about the fight. Of course the need to have the stomach to fight has applicability everywhere. If your state stands against perversions foisted upon you by the federal government and its judges you have to be able to stomach having federal funds withheld, for instance. I work in commercial construction, and we’re located about 2 hours North of Seattle, and we’ve done a ton of work in Seattle. Mostly replacing houses with big apartment complexes filled with studio apartments. I wonder if the change from families to single people, or childless couples, is part of what’s contributing to the decay of the city. I wonder if the change from families to single people, or childless couples, is part of what’s contributing to the decay of the city. That’s probably a high connection. I’ll put it another way: adults getting very out of touch with reality, not knowing how humans are meant to live. Older yuppies, singles & dinks (intentionally), are people likely to think money can solve any problem; it is their idol, the source/provider/enabler of their happiness. No, I think that is a smarter solution than what California is doing – or not doing, which is building housing. At least with apartments, working class and even middle class people can afford to live in the city. The people who are out of touch are the long-term homeowners who gained all sort of benefits in decades past and now want the door shut so they can enjoy unearned gains on home appreciation due to severe zoning restrictions that limit supply while still partaking of services provided by cheap immigrant labor who are willing to live one family per bedroom. Edited to add: the change to single people and childless couples comes from the lack of affordable housing. Allowing for greater density to be built is the most important factor to reducing housing costs. Edited to add: the change to single people and childless couples comes from the lack of affordable housing. Housing is only one part of a stew with many ingredients: schools, crime, transportation, jobs, drugs and alcohol, and yes, theology. Our culture is deeply broken. God have mercy. I think we can simplify this to say that people need Christ. What will cure people from a life of addiction? Only Christ. He alone is the fountain of living water, and until we come to him, all we will ever know how to do is go from broken cistern to broken cistern (Jeremiah 2:13), searching for satisfaction and never finding it. What will cure a city of foolish, impotent, self-destructive leadership policies? Only Christ. In him alone are all the treasures of wisdom and knowledge (Colossians 2:3). Until men fear the Lord, they can not be expected to govern wisely (Proverbs 9:10). Apart from Christ, the propensity of men will always be to govern wickedly, calling darkness light and light darkness (Isaiah 5:20). 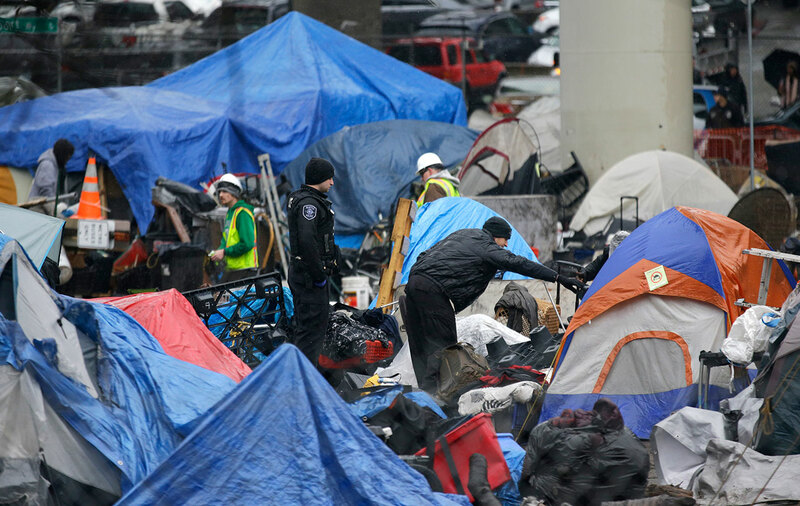 This Seattle thing is just a microcosmic example of Romans 1 playing itself out at every level of society – both on the streets and in the governing leadership. When men cast off the knowledge of the Lord, they will be given over to their depravity until they can no longer distinguish up from down. When we sow the wind, we will reap the whirlwind (Hosea 8:7). the change to single people and childless couples comes from the lack of affordable housing. 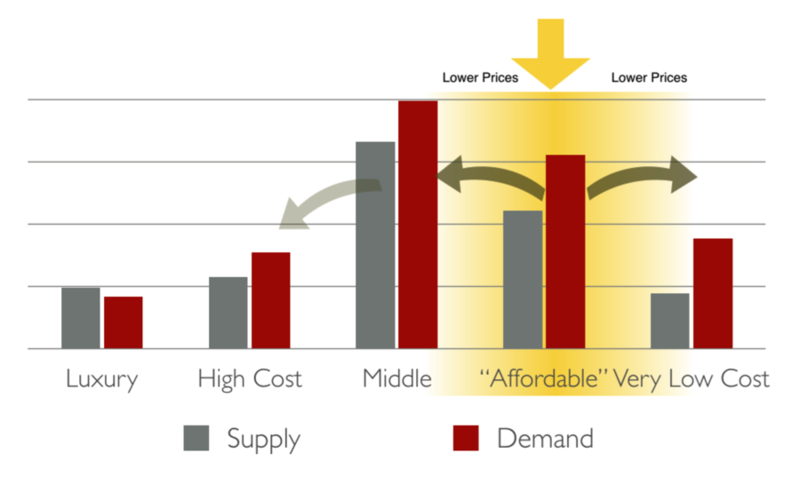 Allowing for greater density to be built is the most important factor to reducing housing costs. You are right that high cost of housing hurts families. However, I googled it, and the average size of new studio apartments being built in Seattle is 486 sq ft, and average apartment size overall is 711 sq ft. Those are the smallest averages in the nation. Somehow I don’t think knocking down 3-4 bedroom houses to build 486 sq ft apartments is encouraging families, it’s catering to intentionally childless people. Healthy communities don’t have a building boom that excludes families and children. This sort of static view is the wrong way to look at it and inhibits the development of a sensible housing policy. If a block of single-family homes is torn down and replaced with apartments, the number of people who can live on that block substantially increases. Yes, there is some loss of single-family homes, but more homes become available elsewhere as singles and childless couples who are sharing rooms in houses move out of houses and into apartments. I think I’ve poorly communicated my point, which is causing us to misunderstand each other. I don’t mean to say that that city development planners or anyone else is trying to drive families out of Seattle by tearing down their houses. The apartment size is, as you pointed out, largely driven by current needs. 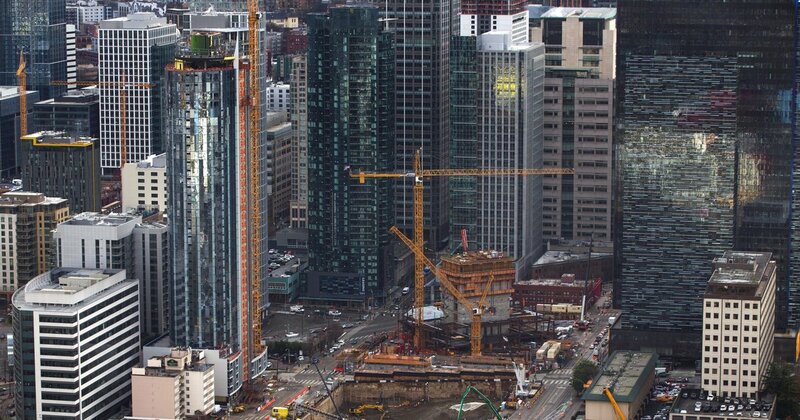 What I meant to point out was the fact that Seattle is currently experiencing a major construction boom. This is generally the result of a healthy, thriving community. However, as the video up thread says, Seattle is Dying. I wanted to point out how these two things could be connected. Seattle isn’t growing through lots of children, or lots of people moving there because it’s a good place to raise a family, rather that families are leaving (many smaller communities North of Seattle are undergoing a housing boom) and they are being replaced by single people who are largely planning on remaining childless. Hence the desire for living spaces which don’t allow much room for a family. This does not make for a healthy city, despite outward signs of growth. What I meant to point out was the fact that Seattle is currently experiencing a major construction boom. That may appear to be so, but I think building of housing in Seattle is still falling short of demand. That said, Seattle is light years ahead of California. 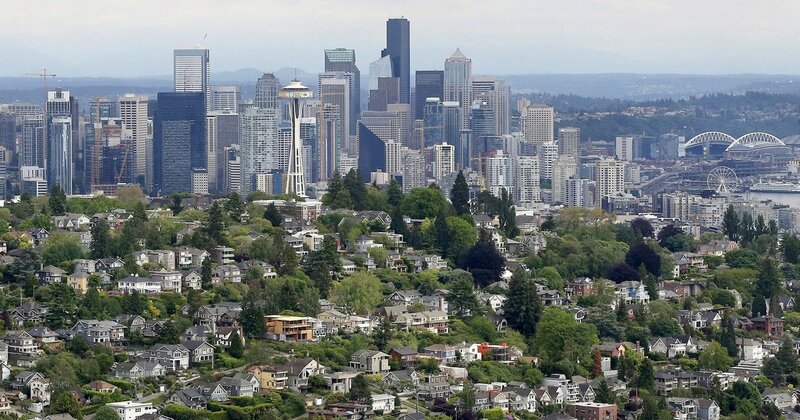 Seattle isn’t growing through lots of children, or lots of people moving there because it’s a good place to raise a family, rather that families are leaving (many smaller communities North of Seattle are undergoing a housing boom) and they are being replaced by single people who are largely planning on remaining childless. You’re mistaking cause and effect. The lack of affordable housing is driving out families, and singles move in rather than families because it is only singles sharing housing and childless double-income couples who can afford to live there. If you bring down the cost of housing, you’ll see more children born and families moving there. What is needed is building of housing in Seattle and especially California that is on the scale of the post-war boom. Hence the desire for living spaces which don’t allow much room for a family. What this is telling you is that demand for housing is so strong that building of studio apartments is profitable. Once enough of those are built to satisfy true demand, then the developers will build apartments for families because that’s where the demand will be. Or maybe not. I wouldn’t be surprised if regulatory costs of building in Seattle are so great that building anything except studio apartments is a money-losing proposition for a developer. Nimbyism and the very restrictive zoning it creates is very destructive to families. I read an interesting article recently that explained one aspect of housing. It used to be that people thought if you just built any housing it would drive all housing costs down. It turns out that building high-end housing doesn’t help people on the low-end much at all. The trickle-down doesn’t make it that far. In other words, housing isn’t quite as fungible or something like that as you might think. It falls into types, and building outside those types doesn’t help keep costs down hardly at all for very different types. building high-end housing doesn’t help people on the low-end much at all. Bloomington is the perfect example. Tons of small apartments being built downtown but no—and I mean no—workforce housing ($150-225K). Liberals despise the working stiff. From what I’ve read, when there is a huge deficit in homebuilding, then yes, building a little bit of high-end housing doesn’t do much of anything to help the low-end. Basically, the housing market is so severely distorted in “unaffordable” cities that building a little bit here and there doesn’t provide an accurate demonstration of what would happen if zoning restrictions were lifted to allow development to truly meet demand. Liberals despise the working stiff. And conservatives love regulation when it comes to stopping people from freely entering into economic transactions that would increase housing density in their neighborhood. From what I’ve read, when there is a huge deficit in homebuilding, then yes, building a little bit of high-end housing doesn’t do much of anything to help the low-end. Not what I remember reading. No amount of high end increase impacts the bottom. No amount of low end increase affects the top. They are simply segregated markets. I’ll look for a link. I could be remembering wrong. Regardless, Bloomington is a great example. Many hundreds of additional student apartments have not made any difference in family housing. Many hundreds more wont make any difference either. If we were more honest about the limitations of the market, it would be easier to convince people that governments can hold private development accountable. Doesn’t quite say no amount at the top will affect the bottom, but I still think that’s pretty fair. I don’t mean to be rude in saying this, but if you had read the Seattle Times article I linked to above, you would realize that you made a number of factually inaccurate statements. What is needed is building of housing in Seattle and especially California that is on the scale of the post-war boom. Here’s the article itself again if you want to double check. I’m not sure if this means I’m right about Seattle, but I did want to clarify the actual facts of what’s happening. Well, all that sounds like good news. I wish it would happen in California. But I am still not convinced that there is enough housing overall. The below article says Seattle population has increased by 18% since 2010. Has the available housing increased by 18% since 2010? If not, the current building boom hasn’t caught up to the demand, though it appears to have saturated the studio market. New census data show Seattle notched another year of impressive population gains in 2017. We've now outpaced Austin in rate of growth since the start of this decade, ballooning 18.7 percent, or 114,000 more people. Question: Is it easy for a developer to buy property in Bloomington, tear down whatever is there, and build whatever type of housing – single family, townhomes, apartments, etc. – he wants? Or is it a complicated approval process with many hoops to jump through? If the latter, that’s the problem, and I don’t see why Soviet-style planning should be expected to address housing affordability for families.